Oscar and Golden Globe nominee for animated film, winner of the Grand Special Jury Prize at Venice 2015 and dozens more awards and nominations from various film forums, unpredictable Charlie Kaufman’s newest creation is here and many film experts around the world have proclaimed it to be the best and also the “most humane” film of 2015! The audience of the 20th Sofia International Film Festival has every right to feel special because it is about to see "ANOMALISA"! A few years ago when the start of this project was announced, the team prepared a kick-starter campaign, because making a stop-motion animated film with an ordinary, humane and non-action plot in the XXI century and the time of endless blockbuster comic-book sequels is a challenge more than suicidal. But Kaufman wouldn’t be Charlie Kaufman if he gave up easily! The film tells the story of famous super-motivation guru Michael Stone (David Thewlis) – a husband, father and respected author travelling the US and transforming the lives of many. But in changing other people’s worlds his own becomes ever more hollow and meaningless, crippled by annoying monotony. While on a business trip to Cincinnati he chooses to stay at the Fregoli hotel and is amazed to find a possible refuge from depression in the unassuming Lisa (Jennifer Jason Leigh) who may turn out to be the love of his life… Or is he wrong?! This beautiful, gentle and absurdly entertaining film is the comic and surreal journey of a man through the darkness of his soul. It was created by the imagination and passion ofCharlie Kaufman (Being John Malkovich, Adaptation, Eternal Sunshine of the Spotless Mind) and Duke Johnson (Abed’s Uncontrollable Christmas – a stop-motion episode of Community) and the voices of и е реализиран с гласовете на David Thewlis, Jennifer Jason Leigh, Tom Noonan. The music is by Carter Burwell. 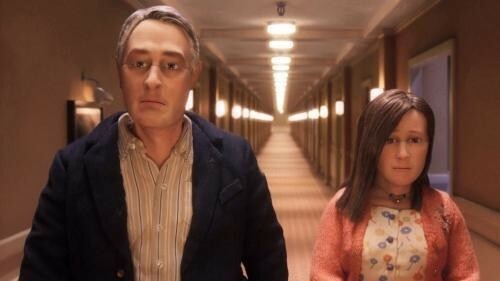 You can see "ANOMALISA" ONLY on 13th March in NDK hall 1 – don’t miss it!